This 2.4 x 4.2m Superior Shed has been installed in our customer’s garden in Liverpool, Lancashire. 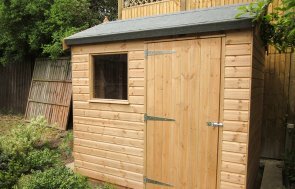 The customers specification was that this shed needed to be used as a large storage shed and DIY workshop. As part of our quality end-to-end service, it was delivered and installed free of charge. 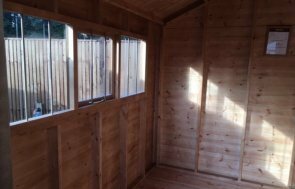 This Garden Shed has been designed for practicality, with double doors for accessibility, and two sets of windows to let in as much light as possible. An additional security pack guarantees the safety of the customers equipment stored there. Our security pack adds 3 essential elements to the buildings and allows piece of mind to ensure protection against any unwanted visitors and are the result of over 40 years experience with garden sheds. The roof has been lined with heavy duty felt, making it waterproof. We use only the highest quality of FSC® certified timber, sourced from our partner mill in North Sweden. The timber cladding on this build has also been protected with Walnut Sikkens Paint. Our years of bespoke construction enabled us to tailor this shed for frequent, long-term use. For a better look at the full range of the other garden sheds we have on offer, use the link below.